Location: 255 Aragó Street Barcelona. Present condition: Outdoors good, indoors adapted to the present Fundació Tapies needs. Visits: Only to foundation public spaces. See Information. The Fundació Antoni Tàpies will be closed due to renovation work on the building until a non fixed date. Minors up to 16 years age: free. Minors up to 16 years age with Student Card: 2,10 €. Timetables, prices and other information may change, please verify it previously. Information: Phone: (34) 93 487 03 15. Projected by the architect Lluis Domènech i Montaner in 1879. This is the first important building of this architect. The façade was initially projected to be made in stone, but it was redesigned with brick. With that material the architect obtained very special effects remembering the Islamic architecture. The central superior part of the building, show three sculptures of Dante, Cervantes and Shakespeare. 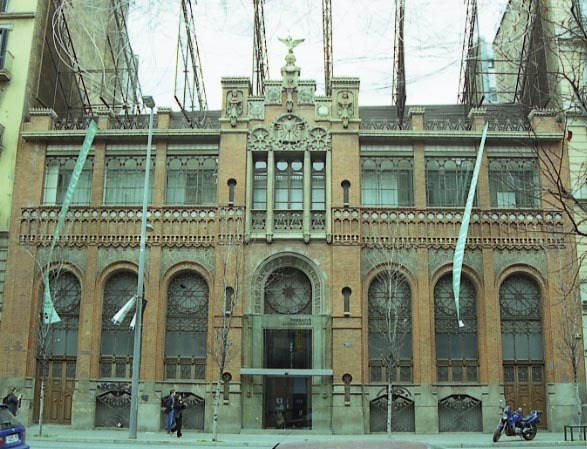 From 1990 the building is the headquarters of the Fundació Tapies (a prestigious modern Catalan painter) who develop cultural activities.